Winter can be brutal for many reasons. Your roof is your home’s first defense against harsh weather. Fall maintenance is the perfect way to ensure your roof is ready for whatever mother nature throws at it. However, regardless of how prepared you are a good strategy is to expect the worst and hope for the best. We’ve defined some winter roofing issues to look out for this season. And should you encounter any of these problems it is best to contact a professional for an evaluation right away. When warm and cold air meets on a surface, it forms condensation. Many times homeowners confuse condensation with a leaking roof. Honestly, whether it is a roof leak or condensation it could cause damage inside your home. The best way for avoiding condensation is making sure your attic is adequately insulated. Furthermore, improper ventilation also contributes to the issue. So, before winter descends, it is best to check your attic’s insulation and ventilation. Matters within the attic could be directly associated with external problems such as damaging ice dams. Unfortunately, most folks with sloping roofs may have experienced leaky flashings at some point. The flashing is the stips of metal placed all along the front edge corners and ridges of your roof, as well as around the chimney and skylights. If they are not correctly installed and reinforced, they could pull away during a violent storm. The result? A leaky roof. Your flashings should be inspected and repairs made at least twice a year. Many recommend doing so before winter, and before summer. Anyone who has spent a blustery wintery evening here in the Chesapeake region can relate stories of the wind whipping around, pretty violently. When wind speeds pick up, it can blow weak and loose shingles off. When your roof is missing shingles, it makes it vulnerable to damage and leaking. If you notice shingles on the ground after a windy night, contact a professional for an inspection. Make any necessary repairs right away. Trees make for a beautifully landscaped yard, but in winter bare tree limbs are defenseless against high winds and heavy snow. Trees that overhang your home could cause significant damage should they blow off during a storm or break under the weight of ice and snow. Protect your home by having trees trimmed before winter hits, or anytime the weather breaks. Also, pay particular attention to older, gnarly trees. Furthermore, cutting trees away from your house also could discourage critters from nesting too close. 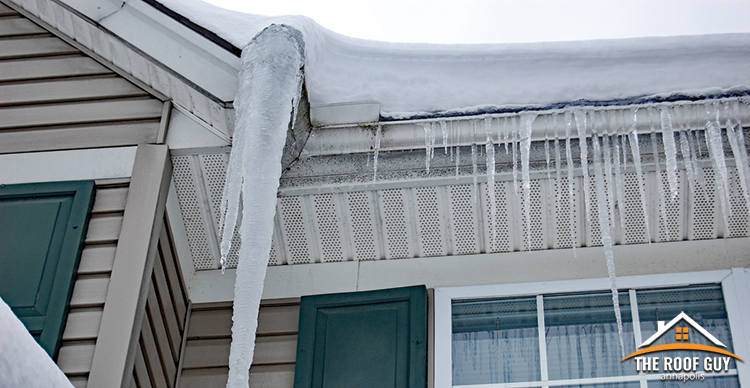 Ice dams could be the worst culprit for damaging your roof. The melting and refreezing of water under shingles usually occurs at the low perimeter of the roof, near the gutters. As water pools behind the ice dam, it has nowhere to escape, except usually into your home. Avoid the damage by cleaning your gutters and downspouts at the end of the fall. Make sure water flows and at no point gets backed up. Also, check the insulation and ventilation in your attic. Icicles are typically a sign of an ice dam. They occur when there are patterns of sunny days, sub-freezing temperatures, and any sort of precipitation. They are usually a result of clogged gutters and downspouts. Want to discourage icicles and ice dams? The key is clean gutters. Should you experience, any of these six winter roofing issues contact The Roof Guy right away. 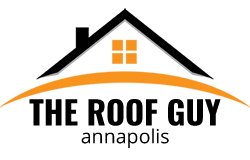 Our technician can provide a full roof evaluation and address problems. Keep your roof in its best shape this season, no matter what Mother Nature throws at it. Schedule your maintenance today. We will come out any time of year, as long as the weather cooperates!